There is TADOTable component on a Form1, which is connected to the database table. EkRTF1 is TEkRTF component. The report template is saved in QuickStart_template.rtf file. The name of the report template is set to EkRTF1.InFile property before executing. The report template contains fields enclosed within the \\ chars. The first is built-in function now(), which shows current date and time. The next is report variable database_name. Its value set before making report from template. Fields \Scan(Customers)\ \EndScan\ are EK RTF commands. 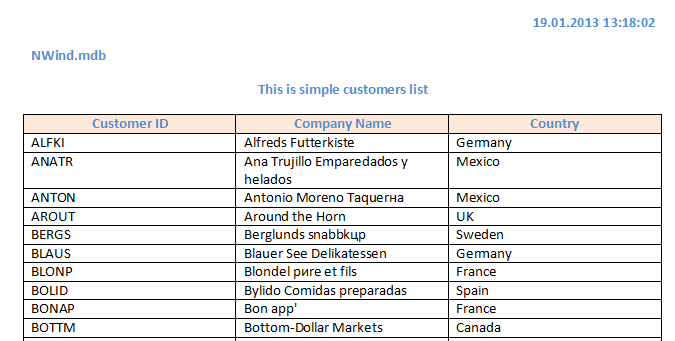 Three fields inside the table are links to Customers table fields.